* Lahore Bachao Tehreek proposes public transport system, congestion tax as alternatives. Civil society members and non-government organisations on Friday formulated suggestions, to be presented to the Supreme Court, on the canal-widening project launched by the Punjab government. 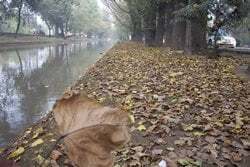 The government had announced a Rs 3.15-billion project in November to widen the canal road by cutting down trees and rare plants. The SC took suo moto notice of the project a day before Eidul Azha and ordered civil society members – who claimed the government was damaging the city by cutting more than 10,000 trees – to submit their suggestions on alternatives for the project. In the meeting that took place at the Nairang Art Gallery on Friday, activists from the Lahore Bachao Tehreek and various strata of the society said the government could introduce new metro and public transport and prohibit the entry of cars to congested areas to control traffic and prevent pollution. The activists said a cleaner canal could ensure a cleaner Lahore, adding the government should launch residential schemes with proper sewage system to and avoid dumping sewage into the canal, which is already causing several environmental problems. They suggested imposing congestion tax on cars in areas prone to jams, introducing proper facilities for pedestrians, regularisation of parking fees and a better traffic-management system to keep traffic moving at all times.